The astonishing story of one man's breakneck race against time... and an implacable enemy. There is no terror so consistent, so elusive to describe, as that which haunts a spy in a strange country. Down these mean streets a man must go who is not himself mean, who is neither tarnished nor afraid. THERE ARE PLACES I'LL REMEMBER ALL MY LIFE  RED SQUARE WITH A hot wind howling across it, my mother's bedroom on the wrong side of 8-Mile, the endless gardens of a fancy foster home, a man waiting to kill me in a group of ruins known as the Theatre of Death. I Am Pilgrim makes for a great (if somewhat weighty) beach read; it's fast, suspenseful and involving, while at the same time not requiring a great deal of thought or analysis to enjoy. I highly recommend the novel to those looking for a well-written and entertaining thriller with which to while away the summer hours. (Reviewed by Kim Kovacs). Delivers thrills and spills...A full tilt mix of Homeland, The Wire and The Bourne Ultimatum. I Am Pilgrim is a 21st century thriller: a high concept plot, but with finely drawn protagonists. The plot twists and turns like a python in a sack. The style is visceral, gritty and cinematic...A satisfying and ambitious book, written with skill and verve. Starred Review. Like many pilgrimages, this one is painfully long and packed with unexpected menace, its glimpses of the goal fitful and far between, but readers will agree that this journey of body and soul is well worth the effort. Starred Review. Sure, the race against time to save the world has been done before but seldom this well. Once you start this taut and muscular thriller, you won't be able to put it down. Starred Review. The novel is gruesome at times, but none of the violence is gratuitous, and unfortunately, it all feels quite real and believable. Don't be put off by the length of this book. The story is tightly plotted, and the pages fly by ferociously fast. Simply unputdownable. The narrative is thrilling: the tension tightens with action...It's a murder mystery, an illuminating account of contemporary international politics and a study of an unusual man......An excellent thriller which as a first novel is really remarkable. Massive in many senses, but none more so than its ability to exert a vice-like grip on the reader....Destined to be spy thriller of the year. Hayes delivers muscular prose, sniper-round accurate dialogue and enough superb and original plotting to fill three volumes. He balances it all with the dexterity of the accomplished storyteller that he so obviously is. I Am Pilgrim is simply one of the best suspense novels I've read in a long time. Rendition yourself into a pulsating thriller that never lets up as it carries the hero and the reader on an ever more desperate race between time and an all too plausible disaster for the world we live in. Great nail-biting stuff! One of the best i have read! The BEST book I have ever read! When I finished this my ecopy of this book, I wanted to immediately do two things...1 Own a hard copy of the book and 2 Start reading it again! I can honestly say I have never wanted to read a book twice. This is by far, the BEST book I have read. In I Am Pilgrim, the villain attempts to infect a large number of people with a genetically engineered version of smallpox — a deadly disease completely eradicated by 1977. Smallpox is caused by the variola virus, which is believed to have been around since approximately 10,000 BCE. As it progresses, victims develop a rash which turns into pustules (hence the common name "pox"). 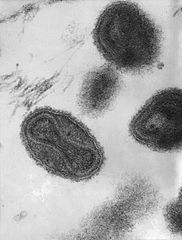 The most common form of smallpox was caused by the virus Variola major, representing about 90% of cases with a fatality rate of about 30%. There is no cure for smallpox, only a preventative vaccine.